Takes enthusiasts deep into the fascinating world of the stationary engines. 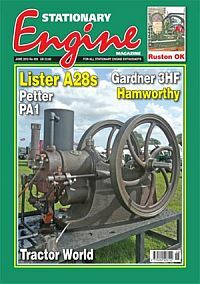 This is the magazine that takes its readers on a wonderful journey into the fascinating world of stationary engines, which are used to drive immobile equipment such as pump or power tools. The collection, restoration and study of stationary engines is a hugely popular hobby, and their continual discovery, identification and restoration is brought alive each month by the experts who write Stationary Engine magazine. The ideal magazine for those who are interested in the history of the engine. Published in English - Monthly. Allow 6-10 weeks for initial delivery.